The soundscape that is VAST caught me completely off guard. I was in my car, listening half-heartedly to the radio when I heard "Touched" (the second song on the CD) Inexorably and unconsciously I was drawn in by this Siren song. From then on I was hooked. I bought the CD and it traveled with me from my house, to my car, to the gym for several weeks on end. 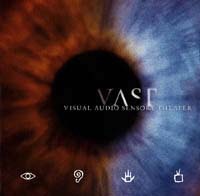 As a conceptual whole, VAST has an almost film-soundtrack quality. It leads you through moods of aggression, tenderness, raunch, love, lust, hate and sanctuary. It is complex with a fusion of many styles of music: a blend of electric and acoustic guitars, an 18-piece orchestra, stark pounding drums, samples of Gregorian chants, the wails form the group Le Mystère des Voix Bulgares, electronic rhythms, and threatening hypnotic vocals. It is a strange composite that holds together completely.